…these are Nordic Skates. Use with your cross country skate-ski or combi boots for skating on ponds or lakes. The long blades allow you to skate further and faster even if the surface is not quite as smooth as the Zamboni creates at your local ice rink. It is another beautiful way to enjoy Maine winters. Conditions are best when there has been a long enough cold spell to freeze the ice and rain or melted water freezes on top. This weekend should be ideal. 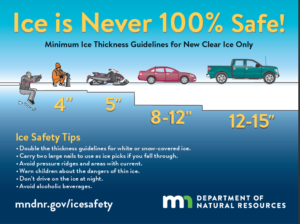 check conditions* before you go on the ice. Ice thickness is very variable. Moving water (rivers) are unreliable.